An enumeration constant for showing or hidding the geographic area selector. An enumeration constant for showing or hidding the resolution selector. An enumeration constant for showing or hidding the time range selector. Constructs a default coordinate chooser. Constructs a coordinate chooser with date constrained in the specified range. Adds a change listener to the listener list. Commits the currently edited values. Returns the end time, or if there is none. Gets the geographic area, in latitude and longitude degrees. Returns the start time, or if there is none. Returns the time zone used for displaying dates. Tells if a selector is currently visible or not. Removes a change listener from the listener list. Sets the geographic area, in latitude and longitude degrees. Set the visible state of one or many selectors. Shows a dialog box requesting input from the user. An enumeration constant for showing or hidding the geographic area selector. Used as argument for isSelectorVisible(int) and setSelectorVisible(int, boolean). An enumeration constant for showing or hidding the time range selector. Used as argument for isSelectorVisible(int) and setSelectorVisible(int, boolean). An enumeration constant for showing or hidding the resolution selector. Used as argument for isSelectorVisible(int) and setSelectorVisible(int, boolean). Constructs a coordinate chooser with date constrained in the specified range. Note that the range is not the same than the range given to setTimeRange(java.util.Date, java.util.Date). The later set only the time range shown in the widget, while this constructor set also the minimum and maximum dates allowed. Tells if a selector is currently visible or not. 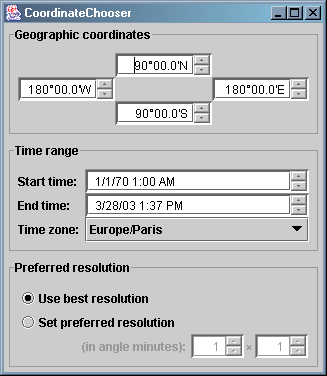 The default contains three selectors: one for geographic area, one for time range and one for the preferred resolution. selector - One of the following constants: GEOGRAPHIC_AREA, TIME_RANGE or RESOLUTION. if the specified selector is visible, or otherwise. java.lang.IllegalArgumentException - if is not legal. Set the visible state of one or many selectors. All selectors are visible by default. selectors - Any bitwise combinaisons of GEOGRAPHIC_AREA, TIME_RANGE and/or RESOLUTION. visible - to show the selectors, or to hide them. java.lang.IllegalArgumentException - if contains illegal bits. Returns the preferred resolution. A value means that the best available resolution should be used. Sets the preferred resolution. A value means that the best available resolution should be used. Sets the time zone. This method change the control's display. It doesn't change the date values, i.e. it have no effect on previous or future call to setTimeRange(java.util.Date, java.util.Date). startTime - The start time. endTime - The end time. The accessory component, or if there is none. Sets the accessory component. An accessory is often used to show available data. However, it can be used for anything that the programmer wishes, such as extra custom coordinate chooser controls. Note: If there was a previous accessory, you should unregister any listeners that the accessory might have registered with the coordinate chooser. accessory - The accessory component, or to remove any previous accessory. Commits the currently edited values. If commit fails, focus will be set on the offending field. java.text.ParseException - If at least one of currently edited value couldn't be commited. Adds a change listener to the listener list. This change listener will be notify when a value changed. The change may be in a geographic coordinate field, a date field, a resolution field, etc. The watched values depend on the arguments: GEOGRAPHIC_AREA will watches for the bounding box (East, West, North and South value); TIME_RANGE watches for start time and end time; RESOLUTION watches for the resolution along East-West and North-South axis. Bitwise combinaisons are allowed. For example, GEOGRAPHIC_AREA | TIME_RANGE will register a listener for both geographic area and time range. The source of ChangeEvents delivered to ChangeListeners will be in most case the SpinnerModel for the edited field. listener - The listener to add to the specified selectors. listener - The listener to remove from the specified selectors. Shows a dialog box requesting input from the user. The dialog box will be parented to . If is contained into a JDesktopPane, the dialog box will appears as an internal frame. This method can be invoked from any thread (may or may not be the Swing thread). owner - The parent component for the dialog box, or if there is no parent. if user pressed the "Ok" button, or otherwise (e.g. pressing "Cancel" or closing the dialog box from the title bar). Shows a dialog box requesting input from the user. If is contained into a JDesktopPane, the dialog box will appears as an internal frame. This method can be invoked from any thread (may or may not be the Swing thread). title - The dialog box title. Show the dialog box. This method is provided only as an easy way to test the dialog appearance from the command line.